Tis the season of peaches, and peach picking we went! With my baby and sis in tow, we went down to the peach orchard to pick suncrest peaches for a cobbler I had in mind. We invited my wedding photographer and friend, Chelsea — who recently moved to the area — and her two adorable daughters to join in the fun and beauty of peach picking. There’s something so beautiful about just being in an orchard — gives you a small, small taste of what Eden could have been like. The nice thing about this orchard is that you can pick and eat as you go. The suncrest peaches were mouth wateringly juicy and so ready to eat. Even Dhara got her fair share of peaches. P.S. The cobbler was amazing. She’s the wee daughter of my dear cousin, Betty. We recently drove down to Fairborn, Ohio to visit this precious little soul, Baby Rachel Elisabeth. Oh, and I didn’t go empty handed, oh no. I went bearing these delightful little handmade gifts for her…although one gift is still in progress, but will be posted soon upon its completion. Also, more photos to come of mama and her baby girl. portrait of a girl from Karachi in narrow salwar & kameez. c. 1870. Dhara wore her first ever salwar at 6 months old. It was part of a special brown paper gift sent by our American friend, Jane. The salwar was a super simple, white, papery cotton — that is, until you washed it and it became a lovely thin, wispy cotton. The salwar was actually meant for a little boy — long sleeved with pants that scrunched up at the heel; however, with a little handiwork, my mom and I were able to turn it into an adorable salwar for a little girl — my little girl. We chopped off the long sleeves because of the hot summer, and also chopped off the bottom portion of the pants so they didn’t narrow down at the ankle, but rather lay somewhat loose and comfy around the ankle like a pair of airy pajama pants. We then sewed some neat hems, and finally added pearly buttons for a more feminine touch, and feminine it was in the end! I love the sweet white on white embroidery at the neckline and arms. As you can probably already tell, Dhara loved every minute in her salwar. She somehow knew she was wearing something different and unique. How odd for such a wee one. I also loved every minute of seeing her in it — it somehow brought this warm feeling to my heart to see my halfsy baby celebrate her Indian roots. I debated over it for a couple weeks and finally took the plunge. I signed myself up for a sewing class ($60). 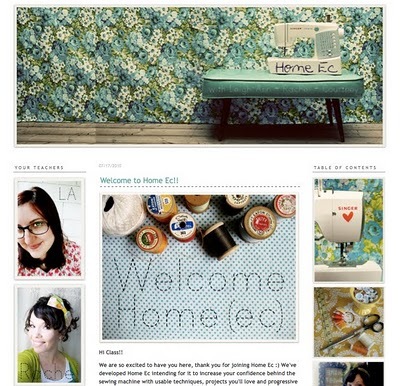 An online sewing class via the super crafty blog, Freckled Nest. The class is called Home Ec and is taught by three fun and super creative gals, Leigh Ann, Rachel, and Courtney. I love sewing and have been sewing for about 9 years now. But I signed up for this refresher course because I’m interested in learning special sewing techniques and working on the 25 class projects — the initial projects being very easy — but the later projects being just up my alley. (I’m really looking forward to the leather bag project!). The projects also looked really fun and useful. It’s neat because the class also has a private Flickr group so students can share photos of their finished work. Today starts the first day of class and Rachel will be showing us two ways to sew cloth napkins. Easy I know, but I’ve never used ricrac before, so this will be fun. I hope to share projects on my blog as they are completed. In terms of fabric and supplies for each one of these projects, I pretty much already have all the fabric and supplies I need in my stash, but I went to the fabric store yesterday to pick up the few items I didn’t have on hand for the first few assignments. We recently experienced a taste of Madras in Woodbine. My mother’s cousin, Beena, and her two sons paid a visit to our neck of the woods for some good old family time. Growing up, my siblings and I were close to both my father’s and mother’s sides of the family. My father’s side is more homespun, easy-going, carefree, lovable, and farmer types. While my mother’s side is gregarious, outspoken, silly (in a very good + comical way), and business types. I love both sides. Both sides bring out different qualities in me. For the few days they were with us, we all had a really lovely time laughing, telling jokes, and just being together. The Madras folks absolutely fell in love with Dhara. Head over heels. It was pretty sweet. Madras Beena is definitely someone whom I admire and respect. She’s got a great handle on fabrics and design. I appreciate the way she picks and chooses what goes together and what doesn’t, and how she designs her own clothes. And, she always does it right. Tailored and perfect. It takes boldness and a certain kind of assertiveness to do such a thing. I feel a kindred spirit somewhere in there. The following is a journal entry from one of my trips to Madras. It journals a day when Madras Beena took me around town. Wednesday Morning, 1:03 AM. Madras, India. I was outdoors the whole day today. Madras Beena and I went to her shop, Sara’s Saris. I didn’t realize it was literally attached to the M.A. Jacob family owned business. Ever since coming to Madras, while driving through the city, my eyes have caught many great big “M.A Jacob, The Carpet People” billboard signs along my various drives. Even when I first exited the airport here, there was a billboard which read, “M.A. Jacob Welcomes You!”…ha, felt very weird. Anyways, such beautiful carpets, draperies, and wall tapestries lined the walls of their 8 level business building. Standing at the bottom of the winding mahogany wood staircase was magnificent…it went all the way up to the eighth floor! Sara’s Saris is a quiet shop with shelves of saris…not too many shelves…but just the right amount. Each shelve had a beam of light lightly falling on it for a showpiece presentation look… I was told by Beena, that her father designed the 3 buildings they owned. Although he is a business man, he has a knack for designing architectural layouts. I could tell these adult children really looked up to their father by the way they spoke of him. Afterwards we went to Mohksha, where the sari prices range anywhere from 2000 rupees to 9000 rupees…a lovely selection indeed. However, my favorite part of the day was probably in Ponder Bazaar, where we headed to the FABRIC STORE. I cannot express how I feel when I enter a fabric store…especially one filled with Indian cottons, silks, and georgettes…of all colors and textures… I myself hung out near the cotton ethnic prints which were made from various vegetable dyes. It also was demanded that I go to the parlor down the street while I was in Madras…so I humbly obliged. : ) While there, I was persuaded to wax my arms…something which I have never done (both waxing and shaving my arms) because I see no need for it…but my relatives can be oh so persuading… Let’s just say that waxing is the most painful thing I have ever gone through in my life. Now that goes to show you I have not gone through much. : ) And to think, you have to do it again two weeks from now because it regrows…ahhhh!!! But really, the pain people go through to beautify themselves…it’s ridiculous. Update: Childbirth is the most intense, even excruciating pain I have ever felt.